Increased production potential, improved machining capabilities, ease of operation, and reduced downtime are benefits realized by a Centerline customer on a spindle system retro-fit of a SNK 5-axis Dual Spindle Machining Gantry. The success of retro-fitting a machine with an enhanced spindle design system can be measured by the overall benefits and increased longevity these benefits bring to the machining process and ultimately, how it positively affects a company’s production environment. The original spindles on this SNK gantry were 20,000 RPM integral motorized spindle assemblies consisting of three piece spindle cast housings. The main housing contained the stator assembly with the front and rear end caps containing the spindle bearing journals. 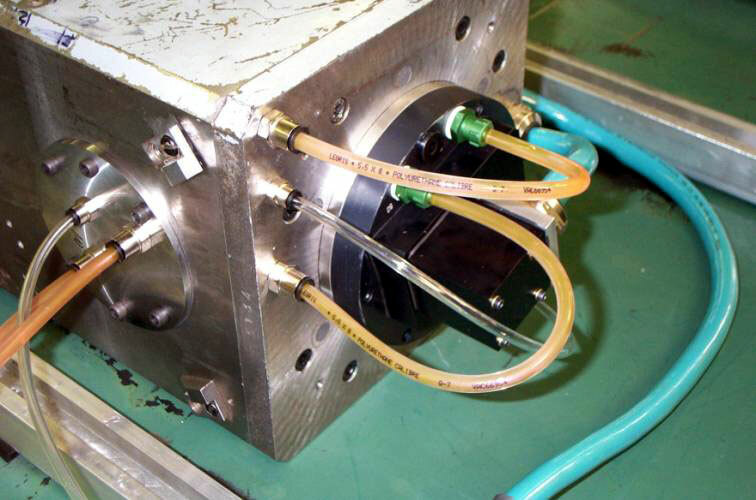 The spindle had liquid cooling, utilized oil lubrication for the spindle bearings and incorporated cutting fluid ports through the spindle mounting block. The spindles had automatic tool change capabilities, but were normally changed by hand per customer preference. Spindle repairs were very frequent on both spindles (multiple times per year). 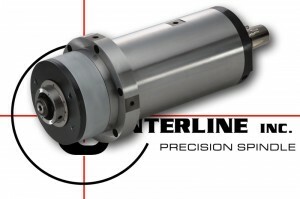 From an economic standpoint due to production requirements the original spindle design only afforded basic bearing replacements preformed by maintenance personnel in order to fix spindle machining problems. 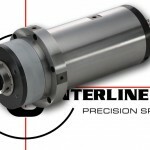 The original spindle housing design produced major spindle bearing alignment problems at each bearing replacement. To further complicate the lack of spindle performance the spindle housing bearing journals were becoming worn beyond acceptable tolerances reducing spindle rigidity. This customer had production requirements for this large gantry that required running the existing spindles at an RPM that put additional strains on the spindle power capabilities while making heavy machining cuts. The challenge of this project to alleviate the problematic issues was two fold. It required staying within the space limitations of the existing spindle head assembly while allowing full 5-axis movement of the original machine design in order to prevent from limiting the machining capabilities of this SNK Gantry. The retro-fit called for a cylindrical flanged cartridge spindle assembly and a new spindle frequency drive installed for each spindle head on this machine. 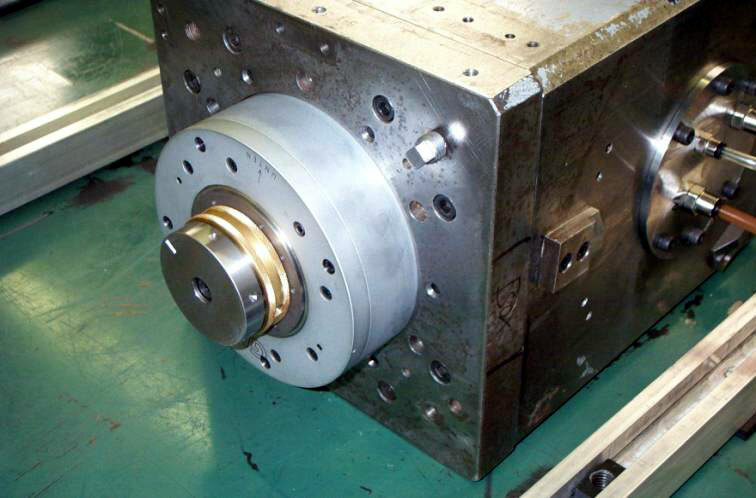 The spindle used for this retro-fit project was a custom 150mm flanged cartridge unit, grease lubricated, water cooled, and operating 5,000 to 15,000 RPM at high torque. The spindle tool change interface is a manual HSK 63 system. The spindle frequency drives installed to run these spindles allowed maximum performance and ease of operation. Compared to the old spindle design this new spindle system provided superior machining finish due primarily to the added rigidity of utilizing a self contained spindle cartridge and the Ultra Precision high accuracy and high rigidity spindle nose bearings. The new spindles further enhanced the machining capabilities of this SNK gantry by increasing the spindle motor horsepower to 12 (9kW) with high torque capabilities. 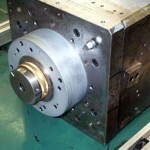 The pictures below show the new flanged cartridge spindle mounted in the existing SNK spindle head assembly. In the spring of 2001 this Retro-fitted Spindle System was initially installed in the SNK Gantry at the customer’s location. Enhanced performance and the ease of operation without compromising the machine capabilities is part of what made this project successful, but what about improving production costs by the reducing downtime and the frequency of repairs? In 2010 and over 8 years after the new cartridge spindles were placed into production one of the spindles was sent in for its very first repair. 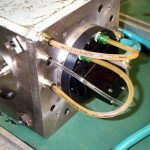 As of March 1, 2010 the other spindle is still successfully operating in the SNK gantry machine.